The Kansas City Metropolitan Bar Association (KCMBA) has elected Lewis Rice member Scott A. Wissel as President-Elect of the Federal Court Advocates Section. The 5000-member Association elected Scott to serve in this role for one year before assuming the office of President in January 2015. The goal of the Federal Courts Advocates Section is to connect federal court practitioners with federal judges, magistrates, and other lawyers interested in federal law. The Section organizes seasonal social events and outreach programs designed to enhance community awareness of the federal system. In addition, it develops and executes continuing education programs to help practitioners navigate the federal courts system and stay abreast of relevant developments. 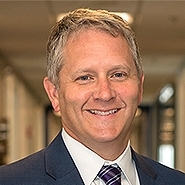 Scott has been an attorney at Lewis Rice's Kansas City office for the last 15 years and has held the rank of member for nearly 10. In his diverse litigation practice, he focuses on real estate and construction matters, banking, and complex litigation. He represents clients in a diverse range of civil disputes including real estate and construction litigation; consumer banking litigation; anti-competition and anti-piracy covenants; and contract disputes of all kinds. Prior to joining Lewis Rice, Scott served for two years as a law clerk to the Hon. G. Thomas Van Bebber, U.S. District Court of the District of Kansas.